Let these Easter Poems remind you of the biblical meaning ....the resurrection of Christ. A day to be celebrated and to give thanks! The world has discovered that Christ is real, with evidence man can't deny. We have the privilege of calling Him Saviour if we obey His command. Hatred filled the hearts of leaders; somehow their laws they must maintain. They would lose prestige and power, they could would not allow His gain! This young intruder's no exception, we'll end this young man's crazy scheme. Created after the downfall of Adam, Satan must never have rule over man! God is the author, Christ the Redeemer, nothing can change this eternal decree. Pharisees tried, thought they had killed Him, yet Jesus rose triumphantly. He is still Ruler, fully in power, great interceder for you and for me. All the things He claimed to be - Son of God and majesty. But now He's under our control, He's stuck upon a wooden pole. The claims He made were sure great schemes; fantastic thoughts and crazy dreams. Now look what happened to His plan - He's nothing more than one dead man! Such foolish things that guys will do, I guess He's just one messed up Jew. My goodness! It's so dark out now but it is only noon! What's happening? What's this all about, why is it dark so soon? You don't suppose that Jew was right, and what He said was true? If he was right, God help our souls! Oh God! What can we do? It took this frightening, midday black to know we lost the fight. He, most innocent of all; we each, a guilty one! But God replies, "Hope is not lost, your trust can set you free. Just do what Jesus told you to: 'Come, believe in me.'" Then Jesus gladly took them in and gave eternal peace. What was it like up in heaven when the Light no longer shone? How did the seraphs and angels respond when Jesus was gone? Did they know of His mission beforehand? Had they gathered to bid Him farewell? Was apprehension a factor? Would there be many stories to tell? Descending to earth as a baby to reach out to all of mankind? Had there been many meetings in glory, preparing for what lay ahead? That this Ruler of all earth and heaven through testings and trials should be led? Relinquish the joy and the honour for torture and hatred from man. Did the angels agree with God's method? Were they even aware of God's plan? To destroy this gift of a Saviour, I'd have said, "Dear Jesus, not You! There's greed, self-love and pure hatred, there's anger, distrust and dismay." He set His mind for redemption, to reclaim man's guilt-ridden soul. It must have been desperately lonely; no Light, no joy, no mirth. And feeling their helpless condition; worse still, not a way they could share. To draw man up from the mire - man who'd been ruined by the fall? Yes! For there could be no other, none else could be found free of sin. T'was Jesus, the pure and the holy, to draw fallen man back again. The angels in heaven proclaiming, "He's conquered o'er Satan's attack!" Who once had been lost in great darkness, now totally in Jesus' control. Proclaiming the way of salvation, announcing the thrill of new birth. Are given the promise of sharing in all that His Word does proclaim. "He is risen! Gone back to glory!" The angels rejoice with great zeal! The portals of heaven are ringing, "SALVATION! 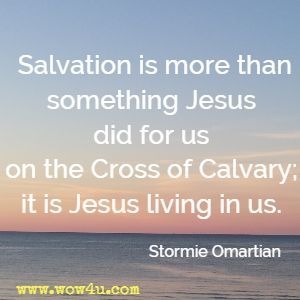 Salvation is real!" The deep humiliation, the angry mob's attack. The words that bite like adders, such cruel words defile. The need seemed only greater, the sinfulness of man. Before my earthly entrance, man had become sin's slave. The price that sin demanded had to be carried there. I live! I walk in glory! No grave had claims on me. Sin is no more a victor, it's been replaced by grace. You are a new creation when Jesus enters in. They resented the power He held. For in all that He did He excelled. Through Christ's power, the mute man could talk. As the marvels of nature declare. That He needs to be stronger than God? He's plotted the way he will trod. And his own importance denied. And willingly changes his place. Transforms the heart that was cold. Christ is alive! Death's sting has no hold! The beatings that the soldiers had incurred. I saw the crowd desirous to thwart God's plan. No ounce of mercy, not a speck of grace. I saw His blood-soaked body struggle there. Much better if this crazy man were dead. He knew that Satan had confused their mind. His eyes were full of mercy through all the pain and care. But they could not discern what He defined. The cross brought freedom, now salvation reigns! His deeds were done out of mercy, for the wicked things we had done. Christ was in charge of His hanging, thereby releasing our soul. He came from the portals of glory where angels and seraphs rejoice. Must have rocked the portals of heaven; would earthly creatures believe? They ridiculed every statement; they mocked Him, the One full of grace. Though He healed the sick and the dying with arms outstretched to do good. The Pharisees called Him a rebel, a loner, a man with no friend. How could His subjects ignore Him, or greet Him with mocking and jeers? Accomplished, His mission was over; no need to do any more. But God, the heavenly Father, confirmed it was done, ‘twas enough. 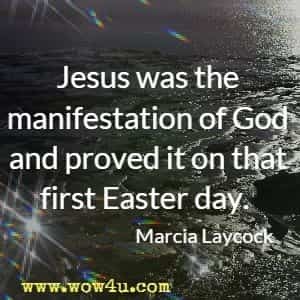 Jesus had allowed it because it was His hour. Man thought that through His capture, death would take its toll. He spoke of God, His Father, but no one really heard. They pierced a sword into His side and then declared Him dead. The enemy was conquered, their plans were now complete. The culprit had been silenced, forever sealed by fate. And placed the guards before it; this man would speak no more! But wait! The peace is broken, the stone is rolled away! The guards lie in stunned silence, this prophesied third day. Behold! The Lord is risen! Who would have thought it true? Those great, far fetched predictions! Is that what God can do? But who of them would listen? No, no one there would hear. Genesis declared it; this story is of old. God merely wants acceptance, a statement to be made. To bend our knees before Him, that we accept His call. But Christ, the burden bearer, will have complete control. He is the mighty conqueror, e'en in life's darkest hour. You may not have tomorrow, no chance to kneel and pray. With open arms extended, He calls, "Stand by My side." "Jesus Christ came into the world to save sinners." Why trade Your golden crown for one incased in thorns? When all of heaven served Your beck and call? And give yourself so freely to us all? You knew You'd be rejected, left alone. Whose only thought was of their very own. God, You, who are so loving; how could You let Him go? Your Son, Your One and Only, grace supreme. Is mankind that important to warrant such a gift? Did You not know about man's evil scheme? He has no thought about eternity. Why be concerned of what may never be? For this You came to suffer? For this You gave Your life? You walked upon the earth amidst the scorn. You knew precisely that's why You were born. Because You bore the grief and paid the cost. A plan no human mind can comprehend. Has stooped this low to be our dearest Friend. The head that once was crowned with thorns is crowned with glory now. They borrowed a winding sheet;. That sinner man may have his liberty. Nor darkness falling - but through faith we know. For sinsick man today, and those unborn. For He alone can save from total loss. And as we come to Him, He does forgive. The nights without sleep, the world without love, rejected, despised all for my sake. No claim to a home in a world which is yours, not a soul who said, "I respect You;"
Even at best those you thought of as friends, by their actions said, "I reject you." You touched the eyes of the man who was blind, who rejoiced at the wonderful contrast. But no one seemed to notice Your needs, at best, Your love was rejected. Thousands of people milling about, not loving, but needing You only. I'm sorry that folks didn't see Your real love, they mocked You till Your final hour. How could You love such creatures of hate? How could You bear all that sorrow? How were You able to shoulder such pain and seeing repeat on the morrow? No one to greet You when weary and worn, to the world You were merely a number. Their rationale was, "Find your own way, we don't give alms in this city." But love was the ultimate goal in Your plan, You knew the road You were taking. Destroying the barriers that kept us from God, You opened the door that we needed.